Has a major league player ever before been injured after he was ejected from a game? Come on Elias Sports Bureau, make yourselves useful for once! Milton Bradley may be headed to the DL because of an umpire, he says. It was manager Bud Black who grabbed Bradley and spun him to the ground, preventing him from going after umpire Mike Winters after Winters had ejected him. Bradley sustained a knee injury due to the takedown. It all stemmed from Winters claiming that Bradley had thrown a bat at him after he had struck out. Hilarity, and then ejection, ensued. The whole thing is, as they say, a big bowl of wrong. "It's terrible. 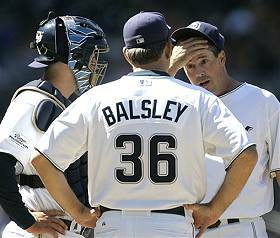 And now, because of him, my knee's hurt," said Bradley, whose Padres lost to the Rockies 7-3. "If this costs me my season because of that, he needs to be reprimanded. I'm taking some action. I'm not going to stand pat and accept this because I didn't do nothing wrong." The Padres were swept by the Rockies and are now only a half game ahead of the Phillies in the NL wild-card scramble. San Diego is 2 1/2 games behind the Diamondbacks in the NL West. Garrett Atkins hit an inside-the-park home run and Brad Hawpe homered for the second time in three games for the Rockies, who are 1 1/2 games back in the wild-card race. • We Want Joba! Even though Joe Torre didn't want to use him, the Yankees' manager gave in to the entreaties of the mob and used Joba Chamberlain in relief in the eighth. Toronto had two men on and was two runs back when Chamberlain came in at the behest of the crowd and threw five pitches to strike out Adam Lind, then followed with a perfect ninth. New York won 7-5. And it was Joba's birthday! Did you get him anything? New York is 1 1/2 games back of Boston in the East. • Bust In The Dust. Chad Billingsley (12-5) got the win as the Dodgers beat the Diamondbacks 7-1, leaving Arizona 2 1/2 games ahead of the Padres in the NL West with six games remaining; three at Pittsburgh and three in Colorado. Oh, the suspense! • Cubs Are Smelling Division Title! Derek Lee homered and Carlos Zambrano got his career-best 17th win as the Cubs beat the Pirates 8-0. Coupled with Milwaukee's 7-4 loss to Atlanta, Chicago is looking pretty, pretty, pretty, pre-tay good at 3 1/2 games ahead of the second-place Brewers in the NL Central.